I have often said that the Holocaust stole from me a heritage, a story, and an identity that I have had to fight to restore. From an early age I felt a pull to recover what was lost. It was a hunger for the stories that my ancestors had left in the past that reached out into the present. From those early years to this very day that hunger has only grown. It has shaped me, it has molded me, and it has brought a sense of reconciliation to a broken family tree. When I was in high school the subject of the holocaust was something I didn't want to talk about. Countless classes focused upon the subject with such intensity that it made it almost unbearable. At that time I was learning in my own research what had become of those who came before me. I was reading names of people my family had forgotten. I was reading how they had been abused, neglected, and sent to die at the hands of heartless governments and societies that hated them. For me, the class room was an uncomfortable battle field with the images and stories I was starting to believe were best forgotten. But you don't get to look away when this sort of awakening is taking place. You don't get to block out the emotions that claw at your heart and rip at your soul. The faces of the betrayed are constantly there to remind you that their story cannot be forgotten. The realization they bring is that if we forget, if we choose to forget, it will always come back in one way or another to remind us. Genocide has a way of showing us the worst aspects of what we are as human beings. It takes from us the hope for humanity as it blinds us the few good aspects of mankind we have left. In that tortuous state it drags us to a point where we must deal with the sins of our collective past. It demands that we pay for our indifference to the suffering of others, our inaction in its presence, and the complicity with its very existence. So when Bosnia plunged into the hellish depths of "ethnic cleansing", genocide by another name, I attempted to check out. I didn't want to see it anymore. For a short time I didn't want to believe it could happen. And at that age I couldn't understand all of what was happening to the Bosnian people. 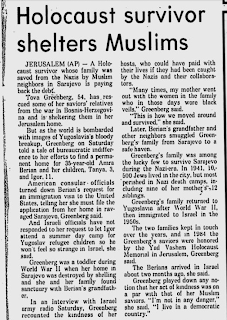 That was until years later when I read about Jews who helped save Bosnian Muslims during the Bosnian Genocide. For the first time I had found an aspect of this wretched crime that I could study without losing a part of my sanity. For the first time I could see a small glimmer of hope. Over the years of reading stories like the one in the picture above the ability to look past the seemingly endless darkness of this horrific crime grew. I began reading stories about Rwanda. Then I found stories about Cambodia. And next came stories about the Holocaust. I was slowly learning that even in the nightmare of genocide there are still people who manage to maintain their humanity. That even while the world was burning around them, and even though they had nothing to gain, these people showed all of us what it was to be human. For the Jewish people these stories offered a sense of hope. They showed us that even in times of utter despair there were still people that cared enough to help us survive the pogroms and Holocaust. However for all these "righteous among the nations" that I came across there was one group that was missing. There aren't many stories that show up when one starts to research the Holocaust in the Arab world. At least not ones that speak of heroism that is. Yet when you start to dig a little it isn't hard to find such stories these days. The accounts of Muslims saving Jewish lives are prolific. And they aren't simply confined to North Africa and the Middle East either. Saide Arifova was a Crimean Tartar who managed to save the lives of 88 Crimean Jews in the Ukraine from 1942-43. She was a mere kindergarten director when the Nazi's rolled into the Ukraine. Yet she knew from the start of Nazi occupation that the children in her care were in danger. And from that realization came a hero that even the Nazi's could not manage to break. After forging documents and switching the ethnicity of the Jewish children in her care through tampering with state documents, Saide Arifova's luck ran out. The Nazi's took Saide Arifova in for questioning where they beat her severely. 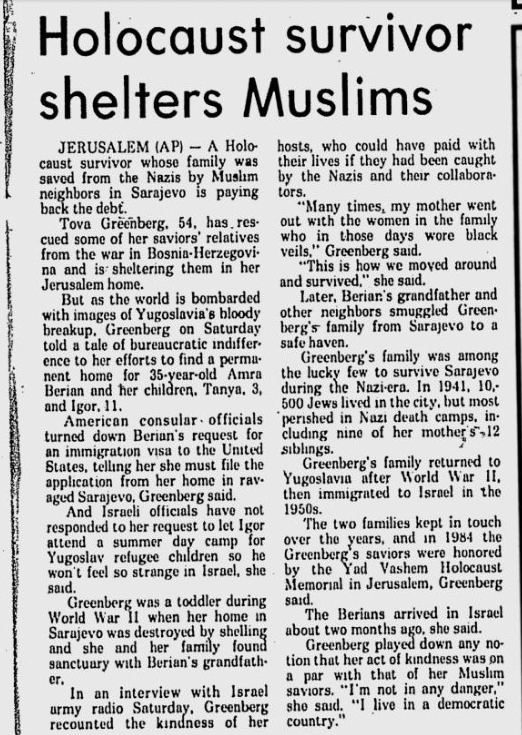 Yet this Muslim woman did not turn her back on the Jewish children she had risked her life to save. She kept to her word and managed to withstand all the abuse the Nazi's had for her. This woman survived Nazi torture for children of a religion that was under threat of annihilation in her homeland. She had shown a courage that others had forsaken. And in the face of all this torment, Saide Arifova managed to even keep her life. When the Nazi's were pushed out the Crimean Tartars faced their own persecution. Stalin ordered the Sürgünlik, the forced deportation of Crimean Tartars to Uzbekistan, in fear that the Tartars had aided the Nazis during occupation. Saide Arifova, despite all her bravery in resisting the Nazis, was deported to Uzbekistan. 45 percent of the Tartars deported would die in Uzbekistan and yet Saide Arifova survived. Only after the Perestroika (reform of the Soviet Party during the 1980s) did Saide Arifova get to return to Crimea where she had so bravely saved those 88 Jewish children. On August 9th, 2007 Saide Arifova passed away. Necdet Kent was a Turkish Muslim who had been born in Istanbul, Turkey. During years of study and building a career as a Turkish Foreign Diplomat Mr Kent had managed to end up in Marseilles, France. There Mr Kent watched as the Germans entered France and installed the Vichy French regime. He bore witness to the horrific implementation of the Nazi race laws. In 1943 Mr Kent was given his first real challenge when faced with Germany's genocide of the Jewish people. Having been informed that the Gestapo had loaded 80 Turkish Jews onto a cattle car for deportation, Mr Kent went down to the station. He would later recall that the cattle car bore an inscription that stated "this wagon may be loaded with 20 heads of cattle and 500kgs of grass". Yet here he stood in front of a Gestapo commandant with a cattle car loaded with Jewish prisoners. Mr Kent ordered that the cattle car be emptied on the basis that the Jews inside were Turkish citizens and Turkey had declared neutrality in this conflict. On all legal grounds the Turkish diplomat was correct in his assumption that neutrality should be extended to the the Jews on-board. However the Germans laughed in his face and told Mr Kent that the Jews were nothing but worthless Jews. Their fate was sealed not because their nationality but rather their religion and ethnicity. Furious, Mr Kent and his assistant boarded the train and refused to get off. The Gestapo ordered the train to continue to it's next destination. Mr Kent and his assistant stayed on-board as the train of deportees barreled onward. All the while the Germans prepared a car at the next stop and a plan to get Mr Kent off the train. Once at the next stop the Gestapo boarded the train and demanded that Mr Kent get off and go back to Marseilles where he belonged. Yet Mr Kent replied that he was a representative of a government that did not believe in such abuses let alone on the basis of religious beliefs. For that reason Mr Kent could not leave the Jewish prisoners on that train in that condition. "I would never forget those embraces around our necks and hands ... the expressions of gratitude in the eyes of the people we rescued ... the inner peace I felt when I reached my bed towards morning." Yet Mr Kent's bravery and heroism was not limited to this one day or this one action. Necdet Kent would continue to reach out to the Turkish Jews and other Jews who had fled to southern France prior to Nazi invasion. Mr Kent continuously offered the Jews he helped forged documents and passports that could help them get to Turkey or unoccupied lands. He also was recorded to have gone to the Gestapo and petitioned for better treatment of Jews on sever occasions... including after Marseilles Gestapo had begun stripping men in the streets to identify circumcised Jews publicly. However when honored for his acts of heroism Mr Kent did not take the opportunity to gloat. Instead Necdet Kent plainly stated that he had a duty to defend and save the lives of all Turkish citizens in France, especially Jews. Necdet Kent died at the age of 91 on September 20th, 2002. Abdol Hossein Sardari has become known as the "Schindler of Iran" amongst those who study the Holocaust. Yet for Mr Sardari this title was never one he boasted about. And despite this it is one that he rightfully earned in countless acts of selflessness and heroism. Mr Sardari was a very intelligent man who had been given leadership of the Iranian Consular office in Paris, France. He was there as the Germans began their march across Europe and thus overrunning Paris. It was from the very moment that Germans arrived that Mr Sardari began exploiting the agreements that Iran had made with Germany for protection of their citizens across Europe. These were agreements that Germany would violate regularly across Europe and yet Mr Sardari managed to hold Paris's Gestapo to the letter of the law. An ever vigilant defender of Iranian Jews, of which there were a sizable amount in Paris, Mr Sardari insured that every Persian Jew he could contact had a viable Iranian passport. For the Persian Jews that did not, Mr Sardari readily forged documents and passports for them. Violating laws and international agreements, Mr Sardari managed to save Persian Jews while holding Germany to it's word. As the occupation dragged on Abdol Hossein Sardari began to realize the complete picture of what Germany had in store for Europe's Jews. Slowly he began issuing Iranian passports and documents to non-Persian Jews across Paris. To make sure that his actions were not exposed Mr Sardari did not ask for permission to issue such documents. Instead, with a sense of bravery, Mr Sardari went about his work right under the eyes of the Gestapo. Iran would later applaud Abdol Sardari for his courage and efforts. Much like Necdet Kent, Abdol Hossein Sardari did not attempt to make light of his own actions in saving countless Jewish lives in Nazi occupied France. When honored for his actions, Mr Sardari clearly stated that he had a duty to save Persians from German aggression, regardless of religion. Almost forgotten, Abdol Hossein Sardari died in 1981 in Nottingham, England. The history of genocide is not filled with very many glimmering lights of hope. For this reason it is vital that history not forget those who bravely stood up to the persecution of others. When all the world would tell them to stand down and ignore the savagery placed at their feet, these brave souls showed us... reminded us... of what we should all strive for. These are just three stories of many. They are lives that were lived in defense of others. Their actions according to them were not heroic... they simply did what they saw as being morally correct. And it is for this reason that they are in fact heroes. In the darkness of the Holocaust they chose to shine like candles in our darkest hour. We should never forget these stories. We should let them live in our hearts, our minds, and in our words when dealing with such adversity. The legacy they have handed to us must never be allowed to be lost. For there is no guarantee that once lost, once forgotten, that we will ever get it back. Want to learn more about this issue and others covered by Alder's Ledge?